At RHRLI, we offer a hair transplant procedure that we believe is the best permanent solution to hair loss you can find out there. The procedure is called the ARTAS® system and it uses robotic technology to transfer healthy donor hairs to where they’re needed. It leaves you with a healthy head of hair and a new outlook on life. We want to tell you about ARTAS® and how it can change your life. You’ve probably heard about other procedures out there and you may be confused by all of the talk. ARTAS® is a robotic follicular unit extraction (FUE) procedure. 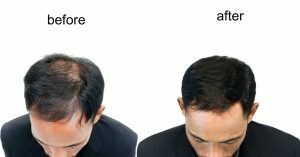 It differs quite a bit from another procedure with a similar sounding name called follicular unit transplantation (FUT). The robotic technology used by ARTAS® is minimally invasive, while FUT requires a scalpel and a long, deep incision in the back of your head. FUT is also known as “strip surgery.” Once the strip procedure is over, sutures are required and there will be a longer recovery time. With ARTAS® no sutures are needed and there won’t be a big long scar. There will be a minimal amount of discomfort and you won’t require prescription pain killers. While FUT patients can experience lingering pain and scalp tightness, that won’t be the case with ARTAS® patients. Patients who undergo the ARTAS® procedure are usually back to normal activities within a few days, while strip surgery patients usually have difficulty sleeping on the sutured area for several weeks. In addition to being superior to FUT procedures, ARTAS® is also more advanced than other FUE procedures. That’s because ARTAS® uses robotic technology while other FUE transplants use hand-held devices. The robotic precision of ARTAS® will give you a better quality transplant as patients won’t have to worry about fatigue being a factor for their doctor. With ARTAS®, each graft remains consistent in quality and your thousandth graft will be just like your first. If you have some money coming from a state of local tax refund, why not change your life? You can boost your confidence and have the appearance you’ve been looking for with the ARTAS® procedure and RHRLI. We’ll be happy to consult with you and answer any questions you may have. To get started, contact us today. Previous Post: « Do You Lose Hair in Winter?